Betty Blocks is a high-quality alternative for PNMSoft. As a rapid application development platform, you can develop every (business) application 8-10 times faster than regular coding. By using the visual model builder, you design tailor made software rapidly and intuitively. As a PNMSoft alternative, the Betty Blocks aPaaS offers a 100% cloud-based and online environment. The entire process of developing, testing, acceptance & production (DTAP-Street), takes place within one environment (e.g. no different servers), thus making the entire cycle optimal. Also, the merging of test environments is done within seconds. 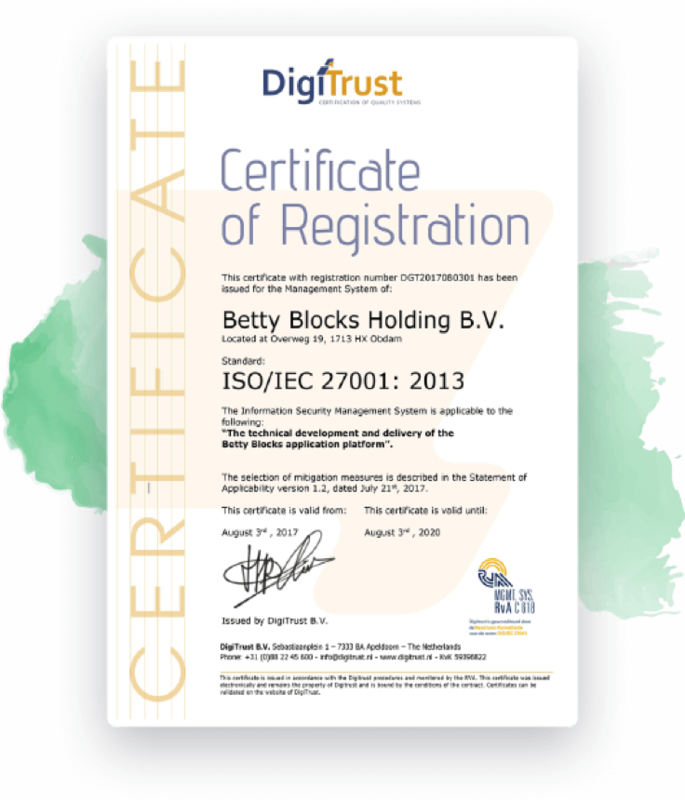 With the ISO 27001 certificate, Betty Blocks objectively demonstrates to the world that we comply with the International Standard for Information Security (ISO 27001) and that we have taken all necessary precautions to protect sensitive information against unauthorized access and processing.